Terre des hommes helps vulnerable children in more than 45 countries. 86 percent of the funds we raise go directly towards our health, protection and emergency programmes. Last year, more than 3 million children and their families had their lives improved as a result of our projects on the field. 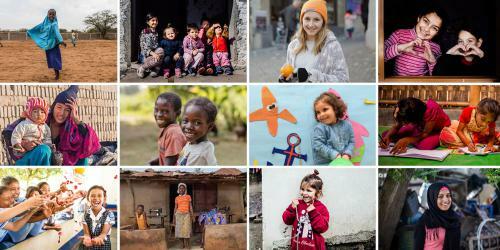 The photos published in this calendar were taken by professional photographers actively engaged with Terre des hommes. We want to thank Diego Ibarra, Ollivier Girard, Natalia Jidovanu, Drawlio Joca, Jean-Luc Marchina, Grace Medina, Céline Michel, Paul Robin, Sajana Shrestha, Daimon Xanthopoulos and not to forget to whole Team of Terre des hommes. The Terre des hommes calendar is printed on recycled paper in Switzerland by Jean Genoud SA in Mont-sur-Lausanne. Texts in English, French, German and Italian.